If you are looking for a plant whose flower resembles the art from a spyrograph in the 1970’s, the passion flower is your specimen. Passion vines are tropical to semi-tropical flowering and fruiting plants that need pruning and training by the second year. Annual passion flower vine pruning will promote thicker stems, more flowers and bountiful fruit. Trimming passion vines during the growing season can help keep these vigorous plants in check and prevent them from taking over an area and choking out other plants. 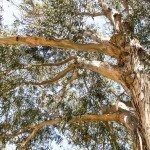 Let’s learn the right timing and methods for cutting back passion vines. The first is to train the plant when young. The next is to promote thicker annual growth and higher fruit yields. The third is to rejuvenate damaged or old, neglected plants. Plants in cultivation are grown up wires with a branching at the top that allows 3 or 4 horizontal stems to be trained for maximum growing surface. In the home landscape, it is likely the vine is tied to a fence, arbor or trellis. You can let the growth go unchecked, but this provides a plant that is difficult to harvest and has diminished exposure to sun for flower and fruit development. Early training of the vine with soft ties will allow it to produce vigorous growth. By the second year, pruning becomes important to form a strong framework. Cut the plant back to the strongest 1 or 2 vines in very early spring. These will produce thick growth and peripheral stems for more fruiting space. By the third year, the plant will have filled out and start producing flowers and fruit. 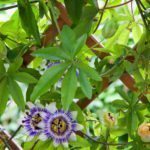 Here are some tips on how to prune a passion flower. Late winter is the optimum time for pruning Passiflora. This is because the plant is not yet actively growing so cuts will not remove the season’s flower buds nor will removing plant material shock the vine into decline. Take out any broken, diseased or dead wood initially. Then, remove stems to those with numerous, healthy buds. The actual amount of plant material you remove should not be more than 1/3 of the plants size, which means annual pruning is an important step to keeping the vine in a certain habit. Some growers choose to leave the vine unmaintained, but this can result in less flowers and fruit. Trimming passion vines lightly at any time of the year is acceptable to keep growth in check but may result in the removal of some of the season’s buds. 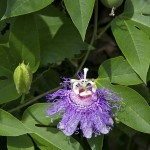 Passion flowers are short lived perennials that can be killed by sustained frost. Short freezes on well mulched plants will result in the dieback of old material but re-sprouting in spring from the roots. In old or unmaintained plants, cutting back passion vines to just 1 or 2 strong stems will force the plant to regrow new stems, which can then be trained. The usual tangle of vines in old plants doesn’t form a good open pattern for light and air penetration and often causes under ripe fruit, disease and insect problems. Once the severe cut back has been accomplished in late winter, spring’s warmer temperatures will encourage new growth that is easier to manage.